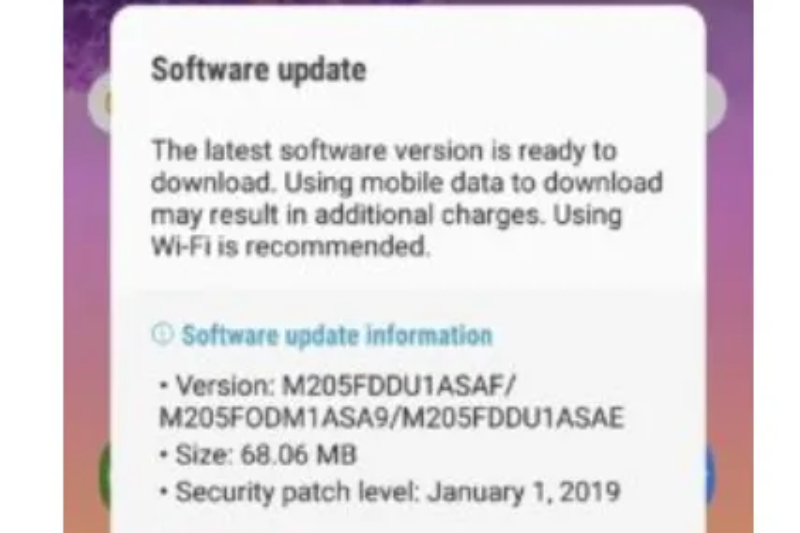 Hours before the formal sale in India on February 5, Samsung Galaxy M20 has got its second software update. The new update of Samsung Galaxy M-20 carries version number M205FDDU1ASA9 are reported to have solved the bug and improved its performance activity. The latest OTA update weighs only 68 MB. Notably, Samsung’s latest smartphones Galaxy M-10 and M20 will exclusively available on sale starting from today. The price of M-20 is higher than its former Galaxy M10. Talking about its performance, M-10 is far better than M20 as several users on Twitter reported that Galaxy M20 is facing battery drain issue. The Samsung Galaxy M20 will be available in two variants 3GB RAM + 32GB internal storage priced at Rs 10,990, while the 4GB RAM + 64GB storage variant costs Rs 12,990. On the other hand, Galaxy M10 will be retailed at Rs. 7,990 for the 2GB RAM/ 16GB storage model, whereas its 3GB RAM/ 32GB storage variant will be sold at Rs. 8,990. Talking about Galaxy M20’s specifications, it has 6.3-inch Full HD+ Infinity V display and powered by an Exynos 7904 processor. The dual-SIM (Nano) Samsung Galaxy M20 runs Android 8.1 Oreo-based on Samsung Experience 9.5 UX. Samsung Galaxy M20 has a battery of 5,000mAh with 15W fast charging support, a wide-angle rear camera, and a USB Type-C charging port. This might be Samsung’s first smartphone to have such a huge battery. How to update Samsung Galaxy M20? If you own a Samsung Galaxy M20 and want to update the latest software which is said to be a more improved version. Then you have to download the software and for that, you will have to go to Settings > Software Update> to download the latest update.